Revisiting the childhood home where horrible family murders took place awakens a supernatural evil for a woman and two friends. A flashback shows a father and his daughter Sarah encountering a mysterious house that suddenly materializes while playing hide and seek in the woods. On the eve of its demolition, Madison returns to her condemned childhood home, which she hasn’t been to in 25 years, with her boyfriend Jake and her cousin Izzy. While exploring the house, Izzy finds a key. Touching the key awakens paranormal activity as everyone begins having odd supernatural experiences. Jake confides in Izzy that Madison has recently been behaving strangely. Jake tells Izzy that Madison has been writing the number five as slash marks on papers she grades at her school. Izzy remembers that Madison also did that when she first came to live with her family following the tragedy in the house. Madison’s research uncovered similar tragedies in other cities involving houses with the same architecture. Those houses would subsequently disappear. Madison, Izzy, and Jake decide to leave, but are driven back inside by a vicious dog. The dog, which Madison claims is her childhood pet Shadow, appears at every window or door each time the trio tries exiting the house. Jake finally attacks and seemingly kills the dog with a fireplace poker, but another dog with the same appearance takes its place. Madison concludes that a presence in the house wants something from them. Izzy goes upstairs to the nursery and vanishes. Madison calls 911, but hears only a taunting voice on the other end. Jake discovers an invisible barrier surrounding the house. Izzy returns in a state of possession. She starts strangling Madison and then Jake until Madison knocks her unconscious. Jake goes into the basement to retrieve rope for tying up Izzy. While down there, Jake encounters the ghost of a small boy. Jake brings a photo album identifying the boy as Seth to Madison and asks who he is. Madison assumes Seth was a brother she did not know she had. Izzy regains consciousness still in a state of possession. Izzy raves incoherently while also revealing things about Jake’s mother she could not possibly know. Izzy blinds herself by dousing her eyes in bleach before collapsing on the floor. Madison recounts a recurring nightmare in which she flashes back to hiding from her murderous mother and hearing the words, “five must die.” Madison then tells Jake she is pregnant, which is what compelled her to come to the house for closure. Possessed once again, Izzy attacks Jake. Madison locks herself in another room where she is briefly attacked by a creature that comes out of a bathtub. Madison exits the room to find Jake hanging from a noose. Madison quickly cuts him down. Now possessed, Jake warns Madison that the curse is destined to go on and on. Jake shows her the key that Izzy found earlier. Madison fights back against Jake’s attack. Jake impales his eye on a potholder hook and collapses to the floor. Madison cuts her foot and begins behaving like her mother did on the day she died. A vision of Seth leads Madison to the nursery where she confronts Izzy. Still possessed, Izzy explains that five deaths are required to open a door to the other side. Kate and Olivia counted as two. Still needing three more, the evil reached out to Madison’s father to lure Madison, Izzy, and Jake to the house. Madison realizes that her mother blinded herself so that she would not be able to find and kill Madison. Madison kills Izzy, but becomes possessed in the process. A vision of her mother tells Madison that the fifth person to die does not have to be her. Madison stabs her stomach to kill her unborn baby. With the key in her hand, Madison crawls across the floor bleeding and opens the front door. Madison seemingly drops dead as Sarah and her father from decades earlier are seen looking at the house in astonishment. 25 years ago, something horrible happened inside Madison’s former childhood home. “Darkness Rising” doesn’t get around to divulging exactly what that something is until 30 minutes in, so prepare for a long road of setup while having only a vague inkling of what the bland build is leading to. On the eve of the house’s scheduled demolition, Madison decides now is a perfect time for a macabre trip down Memory Lane. With her blah boyfriend Jake and sassy cousin Izzy, Madison breaks and enters hoping for closure from figurative ghosts of her past, only to confront literal ghosts in the present. The trio becomes trapped inside a tame paranormal nightmare of shadowy shapes, snarling dogs, and flashbacks to family murders that scarred Madison’s memory. “Something in this house wants something” from the three of them, as Madison so descriptively puts it, and that something will stop at nothing to get that something. Or something. “Darkness Rising” plays as though it were built autonomously using a beta version of a “Scary Movie Generator” app. A creepy doll bleeds from its eyes. A ghost child puts a finger to his lips to whisper, “shhh!” A 911 call connects to a sinister voice with a taunting reply. A hand creeps slowly to pull back a shower curtain. Eyes turn black when someone becomes possessed. A “dun!” music cue plays whenever something ominous pops into frame. 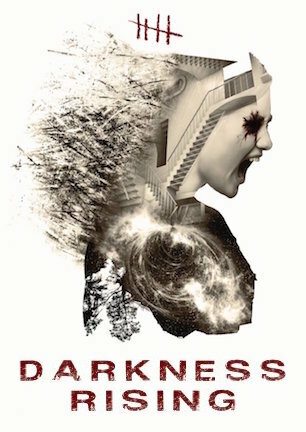 “Darkness Rising” cuts and pastes every basic bit from every boilerplate recycled since the start of horror cinema. For the developer’s sake, hopefully version 2.0 of “Scary Movie Generator” adds options for including a sensible storyline, charismatic characters, or something that isn’t simply a hollow cliché. Because “Darkness Rising” definitely doesn’t feature anything along those lines. Vikram Weet’s script underwrites the story to be cryptic to the point of being incoherent. In contrast, dialogue is overwritten, creating extraneous lines that are obtuse about their purpose or mere echoes of something already said. Not long after, Madison goes on to say: “Oh my God, I think she’s dead! Oh my God, she’s dead! She’s dead! Oh my God, she’s dead! She’s dead! Oh my God! Oh my God! Oh my God! Is she dead?” Strangely, actress Tara Holt recites several of these sentences exactly the same way, as if she did two takes at once and the editor mistakenly (carelessly?) used all of the footage. Either that or the second camera’s setup was used to extend the scene by repurposing the beat from a different angle. “Darkness Rising” is loaded with lines like, “what are you talking about,” “what is she talking about,” “what did you mean by that,” “what are you doing,” and multiple uses of “what?” and “who?” It’s one thing for characters to be slow to piece together a puzzle. When all of the information available to the viewer is maddeningly meaningless, the only possible outcome is obnoxiously frustrating impatience. Taking a page from the production, perhaps I should fire up “Disinterested Review Generator” to spit out blasé bullet points summarizing remaining notes about the flat film: A prologue so pointless, unless stuffing in a Ted Raimi cameo counts, it may as well be from a different movie. Sets lit by little more than flashlights, making some scenes nigh impossible to see. In virtually every manner imaginable, “Darkness Rising” is as generic as generic can be. By the way, is Seth actually Madison’s brother or not? Because if he is, the “rule of fives” math doesn’t add up. Not that “Darkness Rising” adds up to much of anything anyway, except paint-by-numbers pap with only one color on its brush: beige. July 3, 2017 by Ian Sedensky.